Another Way To Attach A Fishing Line. 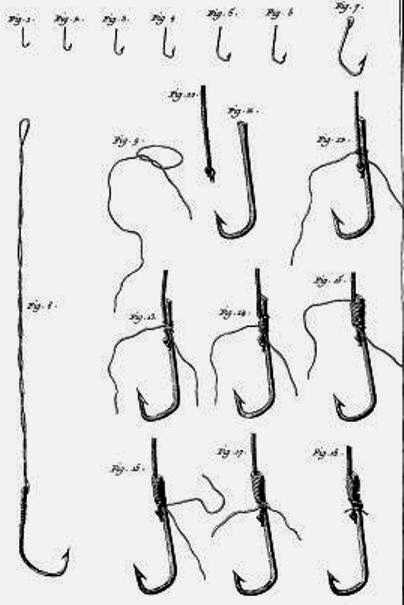 Hand forged copy of an 18th century eyeless fishing hook. It is fire season here in Australia, and the worst one we have ever had so far. Global warming is pushing the temperature up. Using patch material or inflammable wadding can easily start a bushfire. I use leather wads. In the bottom left hand corner of this image you will see the 18th century wad punch that I use, which used to be my Father's. A 3D Look At 17th Century London. Thoughts on 18th Century Shirts, and Woodland Indian Interpretation. The 18th century men’s shirt was classed as underwear, and it was made long enough to be tucked between the legs. This means that the average shirt should at least reach the knees when hanging loose, or longer. It was also used as a nightshirt. Now I am not aware that the trade shirt was any shorter than the ordinary shirt, and yet woodland Indian interpreters are often seen with short shirts and displaying their breechclout hanging below the length of the shirt. The breechclout was traditionally short, the material being as long as the height of the wearer. Now I realise that there were tall and short people, and, it is possible that a tall person could end up wearing a short person’s shirt, but it does not seem feasible that everyone would have a short shirt. 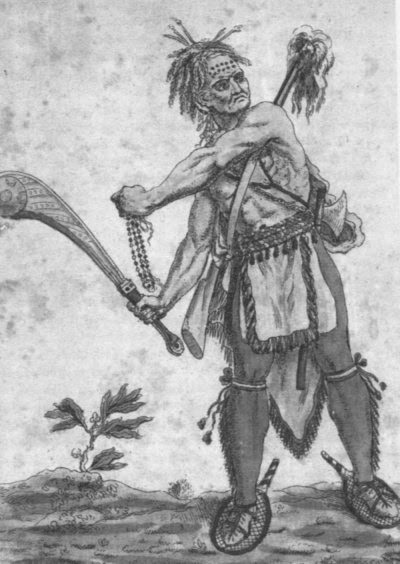 Here we see an 18th century Iroquois warrior with a typical short breechclout. Here we see a Micmac with the same length breechclout, being well above the knees. 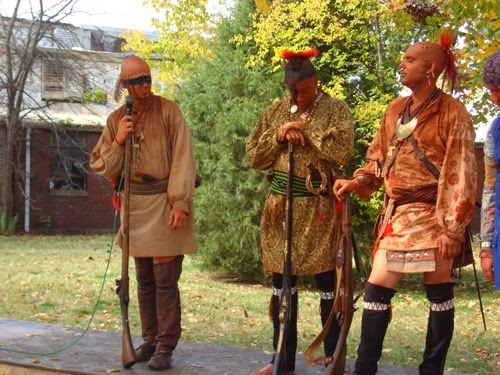 Here we see some woodland Indian interpreters. Only one of which is wearing his shirt short. Anyone else have thoughts on the length of trade shirts? 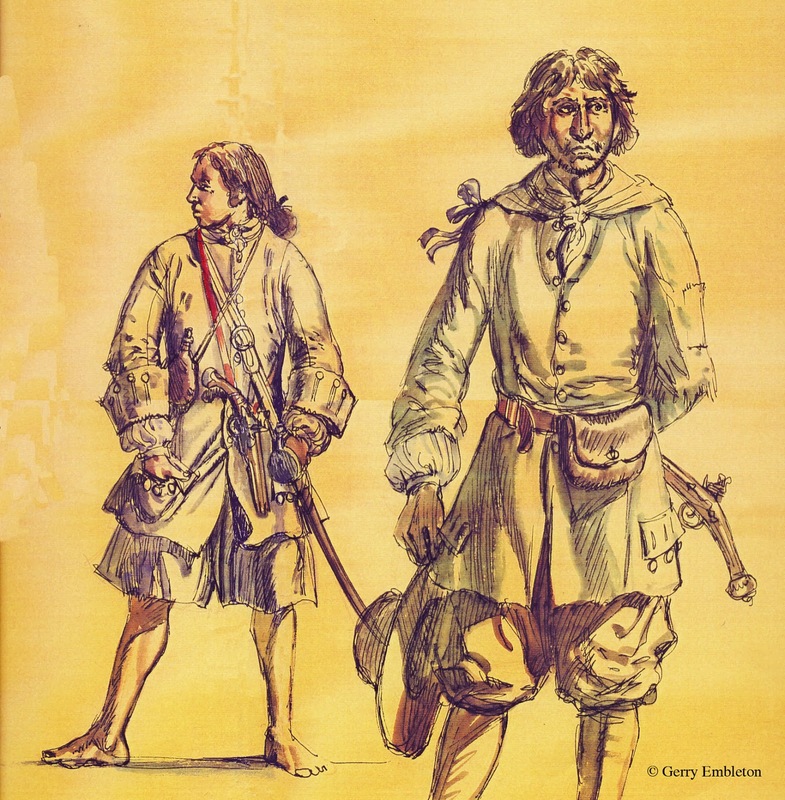 Pirates and Seamen By Gerry Embleton. Wilderness Living. The Raft Duck Trap. Traps and Trapping. The Figure 4 Trigger and The Cage Trap. Making A Quill Pen. VIDEO. 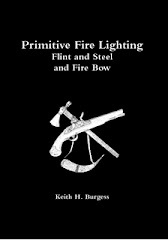 My thanks to the Flintlock and Tomahawk blog for this video. Metals and Trades in the 18th Century. There were also 2 bucklemakers, a scalemaker, a pewterer, 2 bellowsmakers, 8 ironmongers, 2 nailers, 5 locksmiths, a wiredrawer, (fn. 56) an ironfounder, and a man occupied in soldering and leadwork. But since most inhabitants are not, in fact, positively identifiable, we have to treat this list as a sample of trends rather than a census. There is other evidence for some of these occupations at this time. Pewterware of undoubted 17th-century origin bears a Birmingham mark. (fn. 57) At least one Birmingham locksmith of the period achieved a national reputation (fn. 58) and there were several others. (fn. 59) The principal new trade of the late 17th century, however, was gunmaking. We have little direct evidence concerning the Hadley family, who are said to have been the first important makers. (fn. 60) Documentary proof begins only with the intercession by Sir Richard Newdigate, of Arbury, on behalf of the Birmingham musketmakers, which secured them important government contracts. (fn. 61) By 1692, as the Company of Gunmakers of Birmingham, they had clearly a reputation and a corporate organization, (fn. 62) which suggests that they had been practising their craft for some time. They could undertake to make 200 muskets a month and to have them proved at Birmingham according to the Tower proof. By 1707 they were feeling important enough to complain of the competition of the London gunmakers and to threaten national well-being with the removal of 400 men to 'some other nation' if nothing was done for them. (fn. 63) Here again, we have a case of capital being provided by a landowner, for Newdigate, when the gunmakers were short of ready cash in 1696, advanced them £700 on the security of their output. (fn. 64) Apart from the original makers listed in the 1693 contract (William Bourne, Thomas Moore, John West, Richard Weston and Jacob Austin), we find repeated mention of Samuel Vaughton from 1707. (fn. 65) Some specialization was introduced at an early stage. There was, for example, a gunbarrel maker in 1708. (fn. 66) The 1693 contract specified engraved locks and brass components, and no doubt these would be the products of specialists. We know little about the fate of the trade after the end of the war period in 1713 but the skill continued. The leading maker in 1730 is reported to have been one Jordan. (fn. 67) One of John Wyatt's backers in his experiments with a file-cutting machine (fn. 68) was a gunmaker called Richard Heeley (c. 1732). The diversification of metal products can be traced more exactly early in the 18th century. The existence of braziers testifies to the manufacture of seamed or jointed goods. (fn. 69) A candlestickmaker is mentioned in 1729, (fn. 70) and the number of founders or casters, including bell-founders, was on the increase. (fn. 71) By 1733 there was a gearmaker, (fn. 72) and, although he probably made only wooden gear for mills, he would use quantities of iron nails, pins, and sheathing. A smoothing-iron maker emerges in 1721 (fn. 73) and a tiresmith in 1725. (fn. 74) The mention of the tiremaker is significant as coinciding with a well-attested increase in interest in road transport. (fn. 75) Richard Baddeley of Old Square, who was the first Birmingham man to hold a patent for an invention, was concerned in 1722 with the making of 'streaks' for binding cart and wagon wheels and for smoothing irons made of pig iron. (fn. 76) Baddeley is variously described as an ironmonger and a gunsmith and had a furnace at Rushall (Staffs.). Local supplies did not meet the needs of all these trades and we know that the ironmongers had to look further afield to augment the supplies coming from north Warwickshire, south Staffordshire, and the lower Stour valley. Even Sweden and the American colonies were beginning to supply the Midlands with iron (fn. 77) and by 1757 petitions testify to the importance of this source of supply. (fn. 78) Whereas the makers of bits and stirrups and of relatively expensive steel toys required only small quantities of metal, any shortage of raw material would place the nailers and the founders of grates, patten rings, and other mass-produced goods in much greater difficulties. In 1726 the heavy traffic in iron and coal in Digbeth was causing comment (fn. 79) - but the 1,000 tons of pig iron and 500 tons of bar iron produced in Warwickshire in 1717 would scarcely have been enough to cause this or provide working materials for all Birmingham. Thus we find Swedish iron as raw material for Kettle's steelhouses (fn. 80) and, when Swedish supplies temporarily failed, we read of the first attempts to increase American production. Joseph Farmer, the Lloyds' predecessor as tenant of the old Digbeth corn mill which his family converted into a slitting mill for nailers' iron, went to Virginia in 1718 to try to increase the supply. (fn. 81) In Sweden, as in America, timber for charcoal was plentiful and, although by this time Abraham Darby knew how to smelt iron with coke, the secret was clearly not communicated to the ironmasters round Birmingham, for the evidence points to stagnating or even declining production at a time when demand was clearly increasing. (fn. 82) On the other hand, the rationalization of raw material supplies, with the opening of trade routes and improvement of transport, was in itself an incentive to production on a larger scale. One good example of this increase in the scale of production was the nailing industry, then still located in Birmingham proper, though by the end of the century being driven further westwards. We have noticed nailers in various parts of the present city area in the 16th and 17th centuries. Nails were invariably hand made, one at a time, at least until 1780 and increased production was only achieved by specialization and the extensive use of female and juvenile labour. The iron was prepared by rolling the heavy bars into sheets and then slitting the thin sheet into rods which, in turn, were rolled into rods of the gauge required for the particular nail. The rods were cut and headed and pointed by the nailer at his domestic forge. Technically the most complex operation was slitting, and in the 18th century there was an increase in slitting mills compared with blade mills. Thus Nechells Park Mill which, produced blades in the time of Thomas Banks and during the 17th century, was a slitting mill by 1746-7. (fn. 83) Farmer's slitting mill had been Porter's blade mill and was then used for corn grinding. (fn. 84) There are many similar examples of this change of use. (fn. 85) The rolling process was also used to produce sections other than nailers' rods and, apart from those associated with slitting mills, we have evidence of other rolling mills (fn. 86) multiplying in the earlier part of the 18th century. We have already notices of wiredrawers in the previous century: these were probably the first to use rollers for sections, whereas the slitting mills used broad rollers for sheets, either for fabrication or for the cutting of blanks by stamping and pressing. When these trades became more important later, both water and then steam-driven rolling mills were erected in all parts of the Midlands. These alternative occupations, as we have seen, were multiplying in Birmingham. Already, early in the century, a traveller in Northern Italy commented on the 'fine wares of rock crystal, swords, heads for canes, snuff boxes, and other fine works of steel' which he had seen in Milan, by remarking, in the margin, that these things were to be had better and cheaper at Birmingham and London. The order is significant. (fn. 90) In 1754 a dictionary of the arts and sciences, under the heading 'Birmingham Hardware Men', defined Birmingham wares as 'all sorts of tools, smaller utensils, toys, buckles, buttons, in iron, steel, brass, etc.' (fn. 91) The author mentioned that such things were made in London and Sheffield as well, but clearly their home was in Birmingham, with its thousands of artisans, mostly in the smiths' and cutlers' trades. The remark that those who would be apprenticed to such trades should be skilled in writing, arithmetic, and book-keeping is worth noting. The typical Birmingham artisan was a very different creature from the poor nailer at his forge. British Colonial Trade Regulations, 1651-1764 Boston Harbor in the 18th century Act/Regulation Date Significance/Features Navigation Act 1651 Required all crews to be at least 1/2 English in nationality Most goods must be carried on English or colonial ships Goal: eliminate Dutch competition from colonial trading routes Navigation Act 1660 Required all colonial trade to be on English ships Master and 3/4 of crew must be English Long list of "enumerated goods" developed, including tobacco, sugar, rice, that could only be shipped to England or an English colony Staple Act 1663 Required goods bound for the colonies shipped from Africa, Asia, or Europe to first be landed in England before shipping to America. 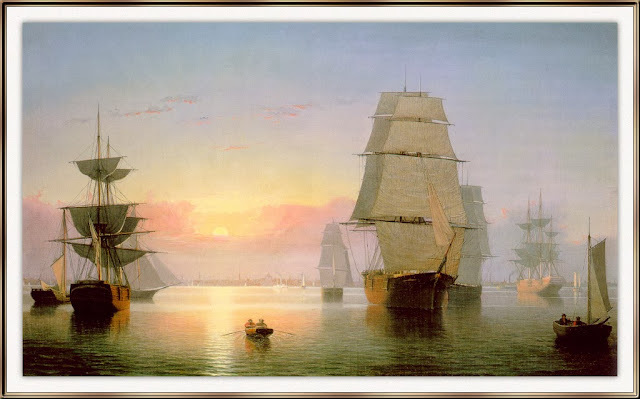 Plantation Duty Act 1673 Required colonial ship captains to guarantee that they would deliver enumerated goods to England or suffer financial penalties. Colonial arm of English customs offices established Navigation Act 1696 Further tightened earlier Navigation Acts Created system of admiralty courts to enforce trade regulations and punish smugglers Customs officials given power to issue writs of assistance to board ships and search for smuggled goods Woolens Act 1699 To prevent competition with English producers, prohibited colonial export of woolen cloth. Hat Act 1732 Prohibited export of colonial-produced hats. Molasses Act 1733 All non-English imported molasses taxed heavily to encourage importation of British West Indian molasses. American Revenue Act (Sugar Act) 1764 Lord Grenville institutes new policies to generate revenue by combining new duties on imported goods with strict collectiion provisions. Tax on French West Indies molasses was actually lowered, but enforcement attempted to end bribes and smuggling. Based on American Journey by Goldfied, et al., in addition to other sources. Please cite this source when appropriate: Feldmeth, Greg D. "Early British Colonial Trade Regulations," U.S. History Resources http://home.earthlink.net/~gfeldmeth/USHistory.html (Revised 24 June 2004). 18th Century Wilderness Living. Experimental Archaeology. The question that is always on people’s minds is “what do I carry”. To answer this question you must first ask yourself what is my persona, and what do I do in daily life. Rarely will you find a period list showing the equipment, tools and supplies carried by a woodsman. There are some diaries of travelers and settlers but these still leave a lot of grey areas, a lot of questions unanswered. Boone was a hunter first and a farmer second. He did leave home for up to a year at a time, but we don’t know for sure where he was in that time or whether or not he had contact with other people in that time. His long hunts suggest that he did not go far, as his brother was able to return to the settlements for more supplies and horses to carry back the deer skins from that hunt. What I am more interested in is how did people back then survive in the wilderness long term. What did they need to carry with them knowing that there were no trading posts or settlements where they were going, and they were going too far from the settlements to be able to return on any regular basis? The only way I can find the information I want is to actually go into the woods and see what it takes to live comfortably, not comfort as we know at home, but relative comfort under primitive conditions. Most, if not all of the gear we carry is for comfort of living, that and the fact that much of it is traditionally what our persona would have owned and carried, we are after all Living Historians first, and survivalists second. We will not compromise authenticity in any way, unless our life should depend on it. · Travel: The correct clothing and footwear. 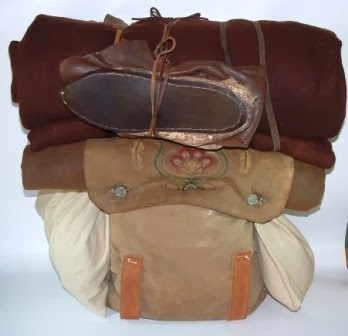 Spare moccasins and perhaps some leather to repair worn out moccasins. · Shelter: We do not want to have to construct a brush shelter every night, indeed we may not need a shelter at all, but when it is raining or snowing, then a wise traveller will carry a piece of oilcloth to keep him/her dry. · Fire: Fire may not always be needed, but being able to make fire is of the utmost importance in the wilderness. So we need flint, steel and tinderbox, and perhaps a fire-bag to keep these in along with some spare tinder and kindling. · Drinking: We will need to keep drinking along the way or we will get sick. We can follow a river or other water course as much as we are able, but we can not be sure of having this water source at all times. So it is a good idea to carry a water bottle or canteen. · Eating: We will need food. Some of this will be supplied by dry goods that we will carry with us, but there will also be a need to hunt and or trap along the way. We can carry dried meat for hard times, but we need to replace this supply at every possible opportunity. To do this we will need a good flintlock gun, a shot pouch and the normal contents, plus spare lead, spare gunpowder, a powder horn and tools to keep this gun in working order. We may need to consider carrying spare lock parts or a spare lock. We will need a lead ladle and ball moulds so we can remould spent lead that we retrieve from shot game. We will need a hunting knife, a clasp knife, possibly a third spare knife and a tomahawk. We will need to carry some snares for small game and possibly some light rope for larger game and for hanging that game. · Sleeping: We will need a good wool blanket and the oilcloth we spoke of earlier. · Washing: Having soap to use is a luxury, but one we can afford, at least for a while. So we will carry a piece of soap and a hair comb to stop our hair from becoming unmanageable. · Cooking: We can quite easily manage to cook meat without a kettle, but a kettle once again makes life just a little bit easier and it gives us more food options. So we will carry a small trade kettle. 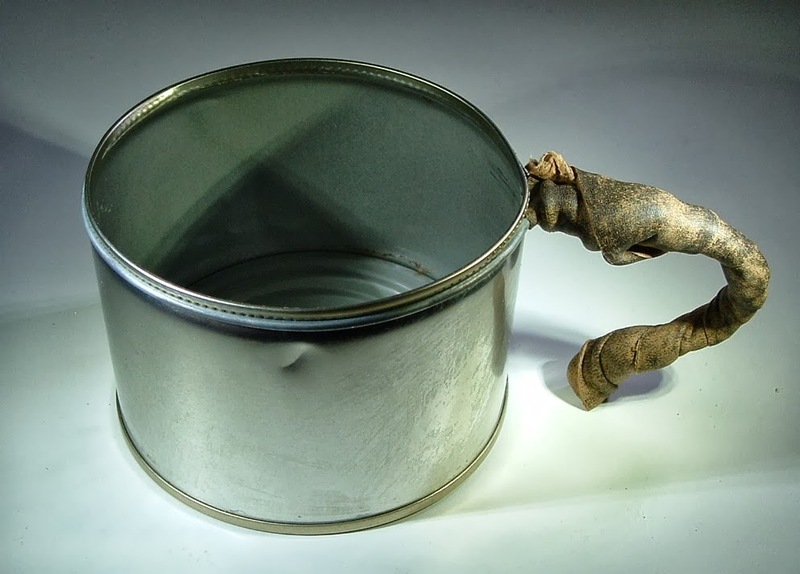 You may also wish to carry a tin cup for hot drinks. 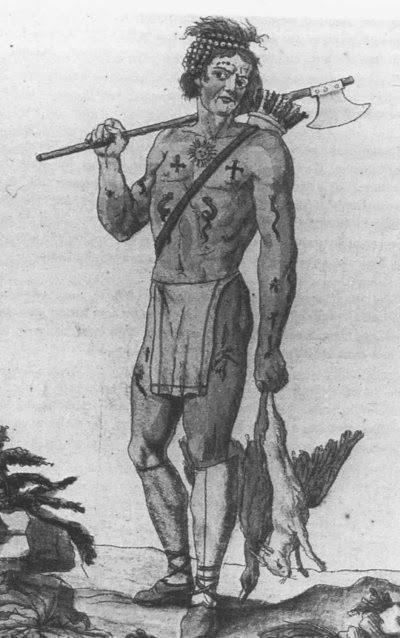 · Semi permanent to permanent shelter construction: Much work can be done with the tomahawk/trade axe, but for heavier cutting jobs a light half-axe would be very useful. Shelters can be secured with cordage made from plant fibres, but a more permanent solution is to use wooden pegs. To secure a shelter with wooden pegs we need to make holes, and using an auger is the best way of accomplishing that task. · Repairing and replacing clothing: With all clothing repairs and manufacture we will need needles and thread. These too can be made, but it is much easier and simpler to carry a housewife sewing kit. This will contain spare bone buttons, linen thread, some beeswax, needles and possibly some pins. I also carry some sinew and strips of rawhide. Aside from the housewife we will also need an awl. Two awls with a wooden sheath wrapped in light linen waxed thread. · Fishing: Fishing is another source of food, and something we should do at every opportunity. Fish too can be dried to eat later or along the trail. So we will need some fishing tackle. This should consist of lines and hooks in its basic form, and a container to secure these items. Weights and floats are easily made but you may wish to carry these also. · Sharpening blades: Your knives and your tomahawk will need sharpening from time to time, so you will need to carry a whetstone and a metal file. Now as you can see from this list above, these are all common needs and chores that need to be carried out. The list of items needed to accomplish these tasks may seem long, but really there is no way around this. You could certainly save some weight here and there, but not without compromising a certain amount of comfort. Wilderness living is hard at best, we do not want to make it any harder than it already is. Our needs for wilderness living obviously go even further that this basic list. There will be ground to prepare for growing crops, perhaps a need to spin and weave. Splitting rails for fencing will require a felling axe and so the list goes on. What you have to decide, is how much of this do you carry? How much do you make on site and what will you need to enable you to make it? If there are other people travelling with you, what do they need to carry? Do they too need to be self-reliant as well as carrying other tools and supplies? 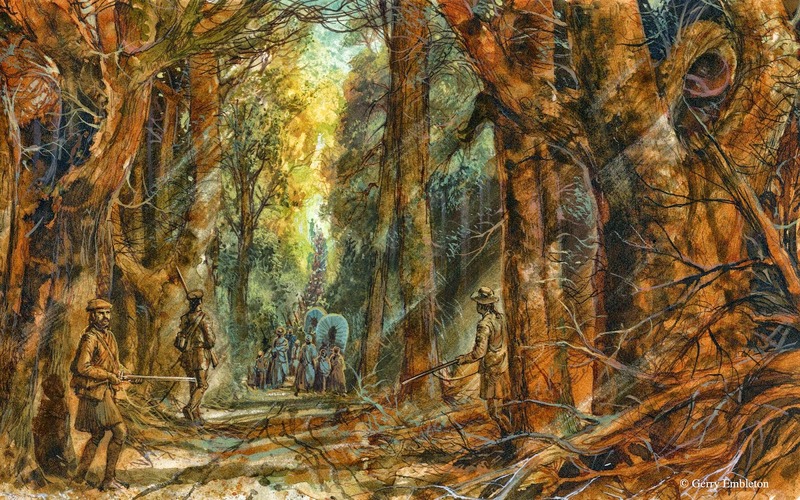 I hope this has given you something to think about, and I welcome any ideas, questions or thoughts you may have on 18th century wilderness living and travel. 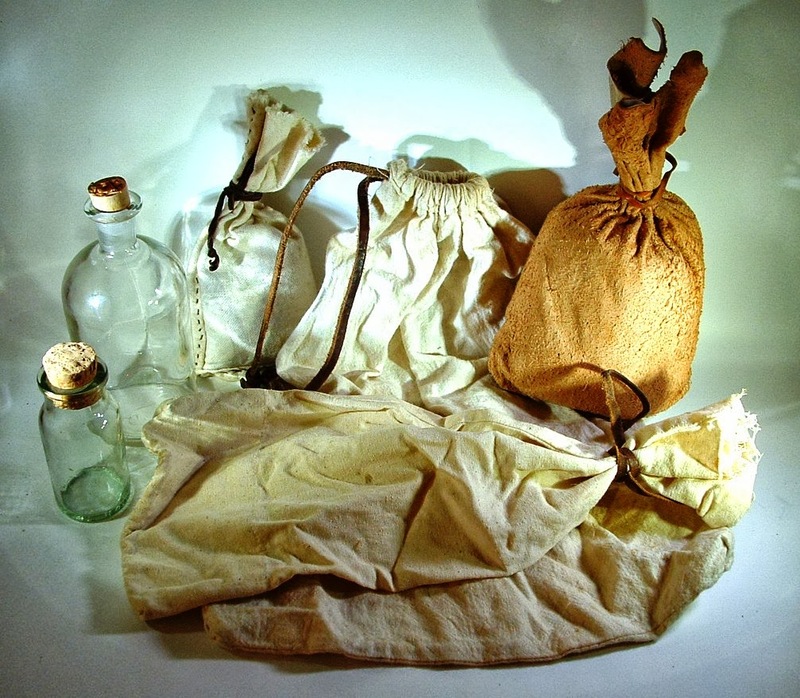 Cotton, linen and leather food bags with a rum bottle and a small bottle for containing iodine. 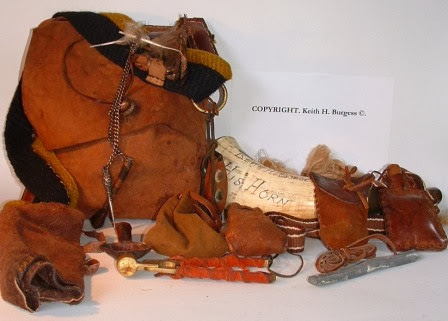 One of four leather gunpowder bags that the author uses to carry spare gunpowder. Tools and spare lock parts. Tales From Green Valley Farm Part 4. 17th Century Green Valley Farm. Part 3. Green Valley Farm Part 2. Preserving Meat. Making Salt Pork. Moulding Round Ball for the Flintlock Gun. Green Valley Farm Part 1. The 18th Century Shot Pouch.